The American bishop who presided over the royal wedding reveals his initial nerves and his first thoughts after delivering the groundbreaking sermon. The Most Rev. 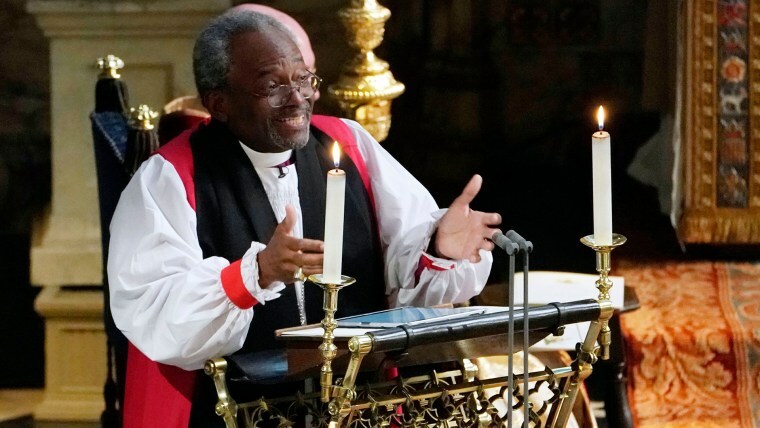 Michael Bruce Curry, whose charismatic sermon nearly stole the spotlight at last weekend’s wedding of Prince Harry and Meghan Markle, admitted he had a moment of doubt over how his homily was received. “I sat down, and I said to myself, ‘Well, I hope that was OK,’” he said Tuesday during a visit to TODAY. It was definitely OK, as the passion and impact of his words continued to reverberate days later. Curry, who is the first African-American to serve as presiding bishop of the Episcopal Church, also became the first American to preach at a British royal wedding, in this case, the marriage of the Duke and Duchess of Sussex. Curry admitted to having some nerves at the very beginning. Curry said he spoke briefly with the royal couple after the wedding at the reception and “they were very gracious." Curry’s sermon cited Martin Luther King and made reference to slavery — which some viewed as daring considering he spoke before an audience that included the British monarch, Queen Elizabeth II, as well as several of her heirs and other members of the royal family. But Curry said he wasn’t worried since he already touched base with church officials and the couple about what he planned to say during the ceremony. He'd also developed a way of learning whether his message was getting through to parishioners.